Oh, the joys of MWC! Where else one can see so much hot devices in one place? Excited as we are though, we'll have to put ourselves together for a few minutes here, as yet another new device has become official. 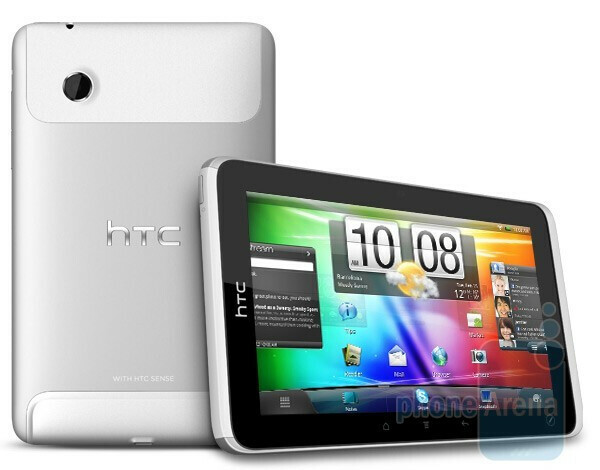 And what a device it is - HTC's first tablet - the HTC Flyer, which was leaked quite heavily in the recent weeks. Anyway, this aluminum tablet is now 100% official, so let's delve deeper and explore what it has to offer! Starting with its most important asset, the HTC Flyer will have a compact 7-inch touchscreen with 600x1024 pixels res, which will come with an integrated pressure-sensitive pen experience, courtesy of the new HTC Scribe technology. This makes the Flyer the first tablet with built in compatibility for work with a pen. The feature will be used for note-taking and drawing. The tablet will be constructed out of HTC trademark aluminum unibody, which will surely give it a sense of classiness and durability. We'll check that once we get to the device for a hands-on treatment! The HTC Flyer will be powered by a single-core 1.5GHz (wohoo!) processor, and will feature 1GB RAM, coupled with 32GB of built-in storage (microSD slot is available). For photo and video taking, HTC's first foray into the tablet biz will offer a 5MP main shooter, as well as a secondary 1.3MP front-facing cam for video chats. Powering all this goodness will be courtesy of a 4000mAh battery that is said to provide up to 4 hours of constant video playback. 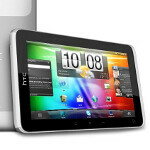 Software-wise, the HTC Flyer will run on Android. Surprised? Not really. However, it might be interesting to know that it actually won't take advantage of Google's Honeycomb OS, but will rather stick with the 2.3.3 Gingerbread experience (some call it 2.4, but it's officially known as 2.3.3). While that may sound like a bit of a setback, it seems Peter Chou and company are pretty confident in their upcoming creation, as they have specifically tailored a version of their Sense UI that will work just fine with the HTC Flyer's large 7" screen. In addition to the HTC Scribe software that we mentioned already, the manufacturer has prepared two more exclusive treats for its tablet, namely the OnLive cloud gaming service and HTC Watch app that will be used for movie streaming and downloading. Since web browsing is one of the main focus of each tablet, it is good to know that the Flyer will support both HTML 5 and Flash Player 10. And who knows, with that 1.5GHz chip inside, the Flyer might even keep the smooth experience even when Flash is present on a web page! We'll wait and see. The HTC Flyer will hit shelves globally starting Q2 2011. Well, we were actually hoping for something a bit more accurate, but we'll obviously have to wait some more before we are hit with a concrete release date. By the way, the HTC Flyer supports T-Mobile US's 3G bands, so it might actually end up with the carrier.